for piano and percussion septet. 2006-2007. 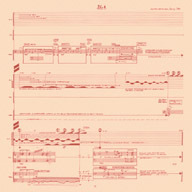 Composed for and premiered by the Ensemble SurPlus from Germany. Conductor: James Avery, December 20, 2007.
for symphony orchestra. 2003-2004. Commissioned by the International Festival of Sacred Music in Quito. Premiered by the Loja Symphony Orchestra, Ecuador, April 2004. 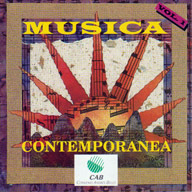 Divertimento Aventure, for woodwind quartet, percussion, piano, and double-bass, 1999. Commissioned and premiered by the Ensemble Aventure of Germany, March 13, 2000. 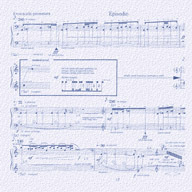 Evocación Prematura, for piano solo, 1998. 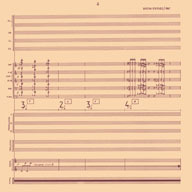 Premiered by Gary Barnett, Europe, May-June, 1999.
for chamber ensemble and electro-acoustics, 1996-1997. Commissioned by the Institut für Neue Musik der Staatlichen Hochschule für Musik, Freiburg, with technical support from the School of Music, University of Louisville, and additional financial support from the Organization of American States and the Musikrat, Germany. Premiered by the Hochschule Ensemble, Freiburg, June 9, 1997. Conductor: Johannes Schöllhorn. 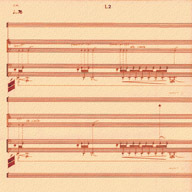 Fragmentos de Resaca, for chamber ensemble, 1995-1996. 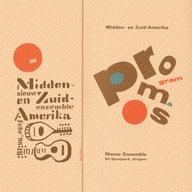 Commissioned by the Nieuw Ensemble of Amsterdam, with technical support from the School of Music, University of Louisville, and additional financial support from the Organization of American States. Premiered in the Netherlands by the Nieuw Ensemble, February 11-15, 1996. Conductor: Ed Spanjiaard. for orchestra and electro-acoustics, 1988. First performance by the National Symphony of Ecuador, Quito, May 1988. 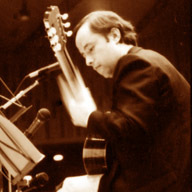 Conductor: Álvaro Manzano. for orchestra and electro-acoustics. 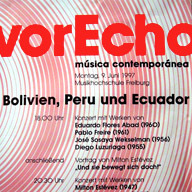 Commissioned by IBM of Ecuador for the First Ecuadorean Festival of Contemporary Music, 1987. Premiered by the National Symphony of Ecuador, Quito, April 10, 1987. Conductor: Álvaro Manzano. U.S.A. première by the Louisville Orchestra, September 16, 1992. Conductor: Lawrence Leighton Smith. for orchestra, voiced flutes, percussion and electro-acoustics, 1986. Premiered by the National Symphony of Ecuador, Quito, November 1986. Conductor: Álvaro Manzano. for flutes and prepared piano, 1985-86. Premiered by Luciano Carrera and Christo Illiev, Quito, July 1986.
for solo voiced classical guitar, 1984. Premiered by Jean-Luc Mas, Espace de projection de l’IRCAM, Paris, November 1984.
for electro-acoustics, keyboard, and percussion, 1984. Premiered by Jorge Dayoub and Diana Arismendi, Paris, November 1984.
for wind instruments ensemble and percussion, 1983-84. Premiered by the National Symphony of Ecuador, Quito, November, 1985. Conductor: Álvaro Manzano. for flute and mixed ensemble, 1982. Premiered by Luciano Carrera and Marie-Renée Portais, Mikhael Czerwinski, Andrés Carrera, and René Bonilla, Quito, 1982.
for orchestra, 1982. Premiered by the National Symphony of Ecuador, Quito, 1983. Conductor: Paul Méfano. “De la música académica contemporánea en Ecuador”, written for Cartón Piedra, supplement of El Telégrafo, Quito, Ecuador, 2012. 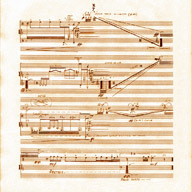 “Le Mandarin Merveilleux, de Béla Bartók”, thesis for the Diploma in Advanced Analysis, Inspection Nationale de la Musique de Paris, 1983, n. d. French. “Paradoja y Subsistencia”, Opus, no. 27, Quito: Centro de Investigación y Cultura del Banco Central del Ecuador, 1988, 22-26. Spanish. “Contribuciones de la Música Popular a la Cultura Nacional e Identidad Cultural”, Conservatorio, no. 2, Quito: Conservatorio Nacional de Música, 1991, 25-34. Spanish. “¿Década Perdida u Obertura?”, Signos de Futuro, Quito: Agencia Española de Cooperación Internacional, 1991, 189-221. Spanish. “Ecuador, Music Profile”, The Universe of Music: a History, New York: International Music Council. Forthcoming. “De las Computadoras a la Creación”, paper presented at the Primer Simposio de América Latina y el Caribe sobre Desarrollo Cultural Asistido por Computadora, Quito, Ecuador, 1992. Spanish. 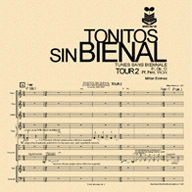 “Sentido y Significación Musical”, paper presented at the Séptimo Festival Latinoamericano de Música, Caracas: Circuito Sinfónico Simón Bolívar, 1993. Spanish. 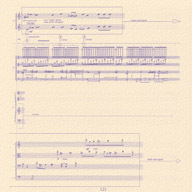 “Y sinembargo... ¡se mueve!”, paper presented at the festival Vor Echo, Música Contemporánea, Institute for New Music, Freiburg, 1997. Spanish.